Preheat oven to 450°F. Roll out pizza dough and curl up edges to make a crust. Brush middle of pizza dough with melted butter and sprinkle with sugar. Bake for about 8 minutes or until golden brown. Remove from oven and spread lemon curd on pizza crust. Bake two more minutes. Allow crust to cool slightly. In the meantime, beat together mascarpone cheese, powdered sugar and vanilla extract. Once pizza has cooled, spread on top of lemon curd. Spread as many raspberries as you want on top of the mascarpone cheese mixture. Sprinkle entire pizza with powdered sugar. Serve immediately. Nearly every Friday night when I was little, my parents would take us kids to the local pizza joint for an all-you-can-eat pizza buffet. It was always the best night of the week. We’d meet up with our friends and their families, get free balloons and stuff ourselves with as much pizza as we could before we burst. I distinctly remember that we all particularly loved the dessert pizza – a thin crust pizza pie topped with glistening jam, crunchy streusel topping and lots and lots (and LOTS) of sugary white icing. It was to die for. At least, it was when I was a kid. Now that I and my taste buds are a little more grown up, the thought of this sticky-sweet dessert pizza doesn’t make me drool as much as it once did. That’s not to say I don’t love me some dessert pizza, but it’s taken a while to find the perfect recipe that’s indulgent without going too much over the top. That’s why I love this Raspberry-Mascarpone Pizza. It’s sweet, with sugar, lemon curd and vanilla, but it’s also incredibly light and refreshing. 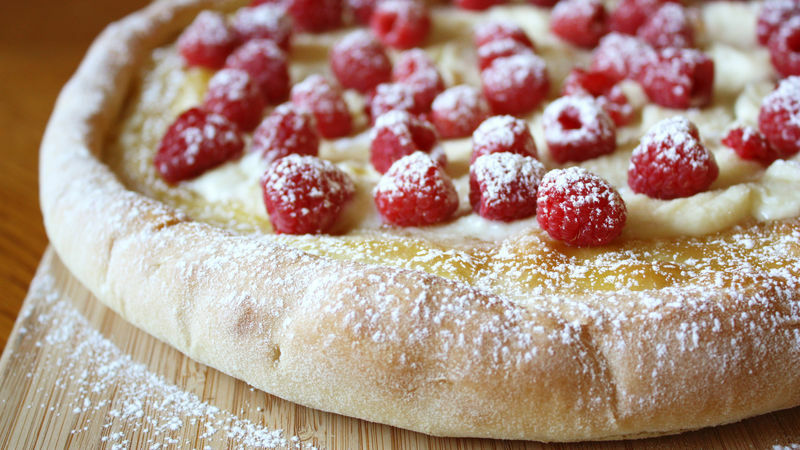 The soft, pillowy dough along with the mild mascarpone cheese and fresh raspberries makes this dessert pizza one that is definitely satisfying, but won’t leave you feeling as if you’ll burst. I have a soft spot for tangy, smooth lemon curd (especially alongside sweet raspberries – yum! ), but you can top the pizza with any flavor of preserves you like. If you don’t want to splurge for mascarpone cheese, Neufchatel cheese works well, too. Even if you don’t like raspberries, you can swap them for your own favorite fresh fruit. No matter what, though, I highly recommend the dusting of powdered sugar – not only does it add just enough flavor to sweeten the deal, but it makes the pizza look pretty, too. Next time you want to have a refreshing, unique dessert, try this pizza recipe. It’s sure to please both kids and grown-ups at the table.